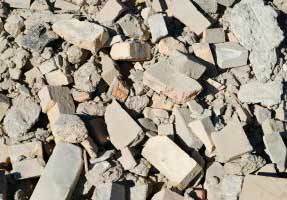 Demolishing and renovating structures made of concrete results in a lot of rubble that can be a burden on landfills. Producing new concrete consumes a lot of energy right from mining the materials, processing them to transporting them to the construction site. It is therefore imperative to recycle concrete as such recycling would result in a number of benefits to the environment and would also help reduce construction costs. Concrete can be directly recycled on site or can be carted to a disposal center to be recycled into new material. Directly recycling concrete necessitates that the broken concrete be used without being turned into a new material. Portable crushers can be used to crush the rubble without transporting it to a quarry thus helping save transportation costs. Both large road-portable plants and compact self-contained mini-crushers are available to handle different loads. Concrete that is taken to a disposable center is broken down and crushed into a material that has a particular size and quality. Certain technological advances in the industry facilitate recycling and have made it a viable option for all those involved. These include methods that can help remove steel and metals without much difficulty, and stronger equipment for crushing. Concrete pieces can be used as gravel in new construction sites. Recycled concrete can be mixed with asphalt and used for sub-divisional pavement use, car park construction, making driveways, slab preparation and more. It can also be used as dry aggregate for making new concrete that is free of any contamination. Broken concrete can be used as an element in erosion control systems. Once the concrete is sorted out the ones that are aesthetically pleasing can be used instead of landscaping stones. Blocks made of wire mesh or Gabions can be filled with crushed concrete which can be used as economical retaining walls or for slope protection.